Decorative wall medallions have been used in many different ways. They can be commemorative, can signify the emblem of a university or even be part of a dignified display in a court of law – signifying the local traditions. Wall medallions can be painted onto a wall or rendered as a plaster relief to commemorate an event or to show nationality. A simple ornamental or decorative medallion might be created from metal or plaster and hung on a wall, making it movable to a different location if desired. Medallions don’t always have to be formal or official. They can be pretty or fun, elegant or just an expression of your personal taste. They can show scenes from books or motion pictures, or even preserve the memory of a favorite pet. Plaster medallions are often the central part of a larger set of decorations, such as a plaster frieze or can be coordinated with other decorations in your rooms. They can even tie together a variety of styles in different rooms. However, plaster ornaments can be damaged by dampness. To preserve them, they should be protected from damp. Some medallions reflect the heraldic designs that were placed on shields and similar items during the middle ages. Heraldry included a variety of designs. The placement of birds, beasts and other items on a shield tells viewers who’s behind the visor. Cultures besides feudal Europe also created decorative medallions that could be hung on walls or worn. Metal medallions are likely to be more durable than plaster medallions and less likely to be damaged by wind or weather. For these reasons, they are more suitable for outdoor display than plaster medallions. Bronze or copper are popular metals for medallions or similar outdoor ornaments as wind and weather merely imparts a decorative patina as the items age. Below are listed ten sample medallions, for your pleasure. These sunburst medallions have a copper finish on them with a high gloss on the centerpiece. There are many tendrils that come from the center ball expressing the light released from the sun. As a set, the medallions are free from each other so they can be placed in any order desired or in different locations to enhance each other’s décor. This plaque has a heavily warn magnesium stone appeal to it. It works well with a light tone backdrop behind it or hanging on a partition. The grain work makes the details hard to see, pulling people’s attention to it and the décor around it. This can bring out the look of plants in front of it or behind an aquarium. This medallion has a golden finish over a warm wooden body. The wide open body allows a lot of light and color through it making this great for a window décor or mirror décor piece. The light tone gives a warm feeling and will work well in a warm environment. The wall behind it will stand out and enhance the wall mount décor. This medallion has an aged seafoam color with patches of rust added to enhance an aged appeal to it. The pattern has a floral design with the sun in the center. The colors will work and add to any light tone wall or stand proudly with a mirror or glass behind it. A sprinkle of light-toned flowers in front of it will stand out strong. With a floral pattern resembling the Fleur-de-Lis on the edges and a massive flower in the center, this medallion makes a nice centerpiece. The light blue and bronze is highly distressed and ads a sense of age and beauty to this piece which will work well with a light-toned wall backing it. It makes a great piece that will bring your décor together. This medallion is very large at 36 inches by 36 inches making it a nice centerpiece for your décor. With its blue and brown coloring, it will stand out proudly on a lightly colored wall. The stone feel will stand out on a wooden wall with its bright colors and complex patterns on each of the medallions coming out from the main center medallion. Made of wood this piece works well with any wooden designed room. The wood is hands carved and highly elaborate with many pieces of nature in it from flowers to leaves. Designed to mirror the famous rose window in famed Notre Dame Cathedral this piece has a religious and noble feel to it, and will give a wonderful look hanging in your window. This piece has an aged gold finishing with a flower design at the heart of the medallion. The flower extends into multiple leafless ivy vines that cross and curl outwards. The distressed look gives a nice aged feeling to this piece which works well on a light tone wall or light wood. This piece brings out and enhances your other décor. 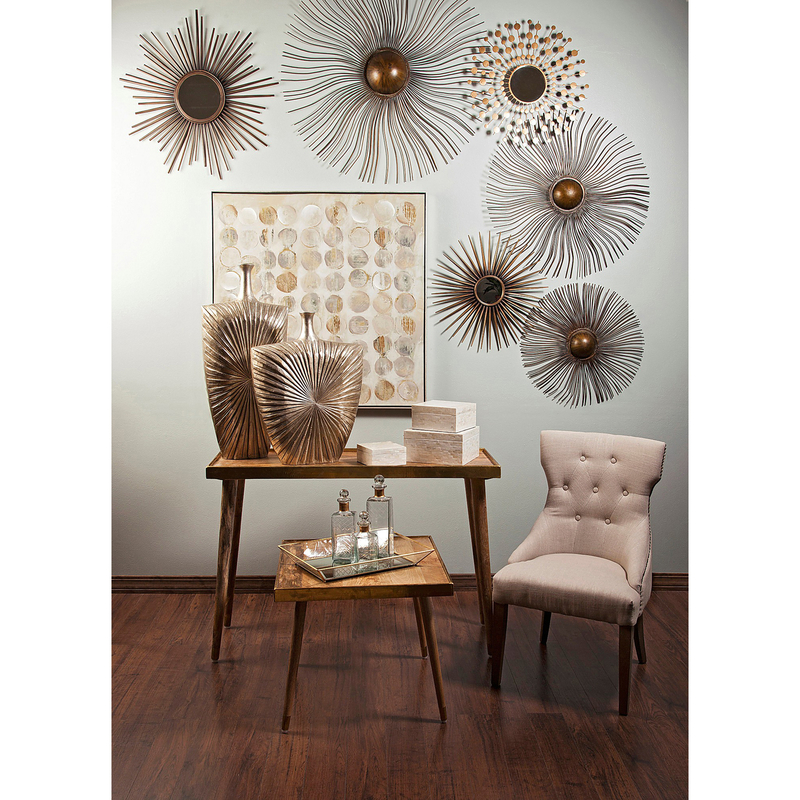 With a highly destressed grey painting and light metal base, this medallion works well with a light tone wall. It has an elaborate carved design on it which draws people’s attention through the crevices. The medallion has a South American design on it and can be added nicely to your classic arts décor. This medallion looks aged thanks to a base bronze and blue distressing. This works well with a light wall behind it to add to the colors. The bronze trim is on the exterior of the piece with the light blue center being highlighted. The design works well with mid-modern styles and classical designs.